This week's Intuitive Tuesday card was the Knave of Swords. Quiet Dreams, you mentioned it in your comment and I think it's worth stating again -- "Interesting how everyone related this card to a person." Court cards usually relate to a person and it's amazing to me how quickly your intuition identifies who it relates to for you. Today's card is about mastering your world using the skills you have -- The Magician -- to do whatever you want. If it is to potty train your two-year-old son, then know that you have what it takes to get the job done. As you can see from the card, as The Magician, you have the energy and magic of all four suits (Wands, Cups, Swords and Pentacles) and can use your wisdom to blend these ingredients to move forward on your path and manifest anything you desire. What The Magician also indicates is that you may need to do some experimentation with all of the tools in your toolbox to get the job done. How does that translate into potty training...or anything else in life? The Wands: Tell me what Wands energy (movement, energy and action) I need to apply to this situation? 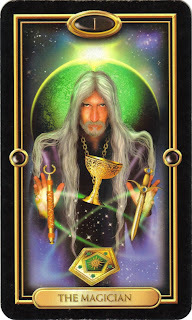 The Cups: Tell me what Cups energy (emotions, feelings and intuitions) I need to apply to this situation? The Swords: Tell me what Swords energy (intellect, logic and reasoning) I need to apply to this situation? Pentacles: Tell me what Pentacles energy (business experience, practical sense, knowledge of material interests) I need to apply to this situation? This will give you the opportunity to ponder the situation/challenge from four different perspectives. And remember, it's not only an intellectual exercise (where you work mostly in your brain); The Magician's Exercise asks you to look at your situation from several different angles and from there, create your own special magic. Play with these questions to help change and broaden your perspective; tune into all aspects of your being, and tap into the wisdom of The Magician to move forward from here. It's like having your own magic wand! Thanks for the extra card. I hope the magician continues to work his magic! Kristin (and her son) had success since your last reading! Thanks for helping me to understand what the 4 suits mean. I am bookmarking this post as a reference. Tonight is school conference for my knave, that I think is going to require all of the gifts of the suits. I like the image of magician, and alchemy, combining the gifts into the right potion. I think tonight probably will have a bigger proportion of swords, a large part cups, against a strong backbone of energy and movement. Pentacles are probably less a factor here.